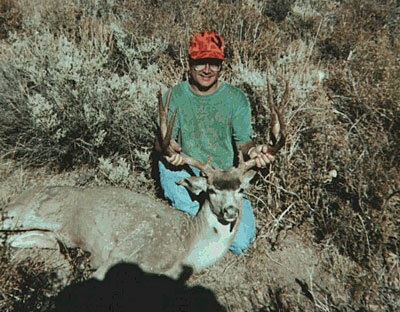 On September 23, 2000, my buddy Dave and I climbed a mountain in the Little Walker drainage of California's X12 deer zone and reached the top at about 11 a.m.
Two hours later I spotted a buck bedded at 330 yards (via rangefinder) above us by a rock outcropping in the sage. Unfortunately, he also saw us and was up and sneaking away almost immediately. I leaned on my spotting scope tripod and took two rushed shots with my .270 (excitement got the best of me) and after the second shot, deer number two appeared trailing the first buck. I calmed down and shot again and missed, then my fourth shot flipped him right off his feet. He immediately was up and running with the other buck and topped a ridge before I could shoot again. We scoured the sage and found a drop of blood which we followed for about a half-mile until we found him piled up dead in the sagebrush on the other side of the ridge. Both bucks were about the same size, which I estimate at 23 inches wide and 18 inches high. This was my biggest buck ever. It took Dave and I five hours to drag him down the mountain to the truck but it was well worth it. He weighed 155 pounds at Ken's Sporting Goods in Bridgeport . I sure hope I get lucky enough to draw X12 again sometime in the future (been trying for 8 years).